When assessing any classic film, one has a duty to point out any flaws or shortcomings even while accepting whatever historical significance the film holds. While it's pointless to criticise an old film without knowledge of its artistic, social and technological context (in other words, what could and couldn't be done at the time), it's every bit as asinine to go all rose-tinted and claim that someone has great worth purely because of its age. We might admire silent films as a genre, but that does not mean that every silent film is up to the standard of The General. We might acknowledge the contribution that The Birth of a Nation made to the art of editing, but that does not excuse its inherent racism. 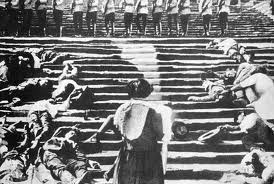 Likewise, it is possible to admire Battleship Potemkin for its advances in the art of montage and for its spectacular set-pieces. But admiration of either aspect is not enough to excuse its overwrought tone, poor storytelling and its abject failure as a piece of propaganda. 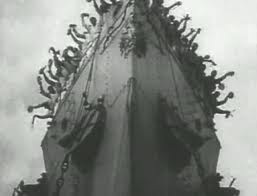 Battleship Potemkin could be called the high point of Sergei Eisenstein's first career. Prior to falling out with Joseph Stalin in the late-1920s, the eccentric Soviet filmmaker had won the favour of the Communist Party with his first feature Strike, an episodic recreation of a 1903 strike at a Russian factory. As part of his theory of montage, Eisenstein intercut scenes of factory workers being suppressed with footage of cattle being slaughtered, using unrelated images to generate an emotional response. 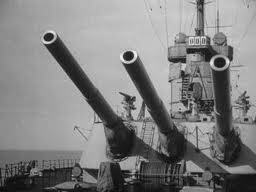 The film impressed Stalin and Eisenstein was commissioned by the Party to make Battleship Potemkin as a follow-up. 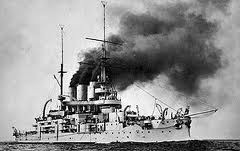 Both Strike and Battleship Potemkin use a past event in pre-Soviet Russia to illuminate the class struggle of the present. Bolshevism, and the Marxism upon which it was based, rested on the principle that history is based upon struggles between the workers and the bourgeoisie, with the former eventually leading a revolution to overthrow the latter and create a society based upon equality and communal ownership (a rank generalisation, but for these purposes it will suffice). By invoking examples of revolts or struggles which occurred before the Bolsheviks swept to power, Eisenstein would instil in people the idea that they were part of a greater struggle, and that liberty was now within their grasp. 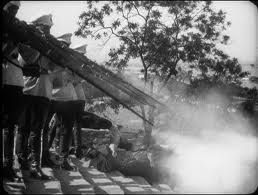 There is no denying that Battleship Potemkin deserves credit and admiration on a technical level. While the age and variable quality of surviving prints makes it difficult to judge Eisenstein's visuals, the use of montage has never been replicated to quite the same effect in any other film. We tend to think of montage as an editing technique to denote the passage of time - cutting together scenes of, say, a couple together in various poses or locations to show how long they have been together. 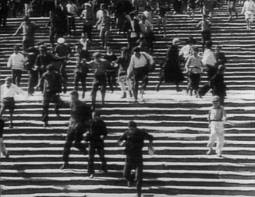 Eisenstein's montage, on the other hand, is driven by emotional response: shots of people are intercut in such a way as to provoke a reaction from the crowd. One example of this comes early on, when the crew are arguing about being served maggot-ridden meat. 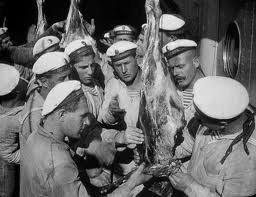 Eisenstein intercuts gruesome shots of the meat with the sailors' faces, to reinforce their degraded state. 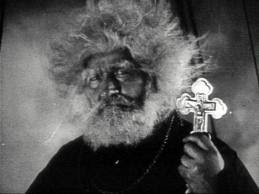 While the direct practice of Russian montage has been virtually non-existent since the 1950s, Eisenstein's work represents a huge step forward in the language of editing: his use of cutting to convey emotion is as radical as D. W. Griffith's use of panning shots to show battles on a huge scale in The Birth of a Nation. 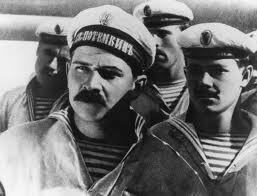 There are also several moments in Battleship Potemkin which are exciting, or at least impressive. The Odessa Steps sequence, depicting a bloody but completely fictitious massacre, has entered the canon of all-time great scenes, and remains without question the best part of the film. The shot of the pram running down the eponymous steps was famously parodied in The Untouchables, which was itself parodied in the third Naked Gun film seven years later. But the scene is also memorable for its shocking moments, from the sight of a young boy being shot to the silent scream of a woman with shattered spectacles, an image which Francis Bacon used as the basis for several of his paintings. 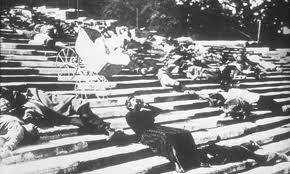 So far, then, Battleship Potemkin would seem to be as much of a classic as it has been revered to be. But once we get beyond admiring its technical achievements, or experiencing brief shock at the violent moments, or gaining some small understanding of the context in which it was made, what we are left with is a lot more underwhelming and poorly constructed than its reputation would lead us to believe. Its flaws are not enough to completely turn our hearts, but all the admiration in the world can't make up for them. For starters, the film is thinly written and poorly paced. Silent films relied primarily on physical expression to tell their stories and flesh out characters, since having actors mouth long speeches intercut with lengthy inter-titles would not be dramatically engaging. By using exaggerated movement and meticulous facial expression, the likes of Buster Keaton and Charlie Chaplin were able to convey in a second what the talkies would need a whole minute to say. This gave silent films an in-built modesty and efficiency, so that when they did run longer than an hour (or two, as Metropolis did), they usually earned the right to do so. 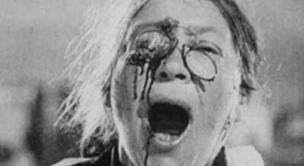 Even at 74 minutes, Battleship Potemkin is about three times longer than it needs to be to serve such a simple story. Eisenstein's use of montage may generate a certain amount of emotion, but it has the side effect of dragging out the action long after the point has been made, and made, and made again. Compared to later propaganda works like Triumph of the Will, the point the film makes about class unity and power is insultingly simple, even to an audience who were potentially illiterate and therefore couldn't read inter-titles. While Eisenstein may have the subtlety of a hammer, he lacks the sharp edge of a sickle. There's no point trying to assess Battleship Potemkin in terms of characters, because the point of Soviet propaganda was to instil collective identity and prioritise class unity over the satisfaction of individual wants and needs. Complaining that there is no discernible protagonist, or that the only charismatic character is killed off after 20 minutes, is nothing more than a reflection of our own film discourse; we expect things to be a certain way because we have been taught that that is the only way. Even if we accept this, however, the film is massively overwrought and narratively fanciful. Because this is a propaganda film, it's a waste of time trying to separate fact from fiction, because everything has been dressed up both in the language of Eisenstein's editing and the political views it takes. 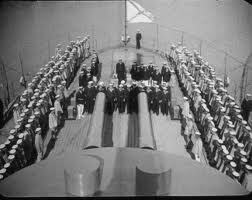 But even with that level of acceptance, it is frankly ridiculous to believe that the whole fleet would refuse to fire on the Potemkin having been impressed by their bravery. Not only is it a huge anti-climax, it's so out of the blue and illogical that it threatens to undo whatever hard work Eisenstein had done up to that point. Worst of all, Battleship Potemkin fails because it does not cut the mustard as propaganda: it does not do what is says on the tin. Just as all good comedies should make you laugh, and all good horror movies should scare you, so a properly made propaganda film should draw you into the story or ideas so that you are convinced by them, even if only for the moment when the film is playing. Propaganda films are the exception to the rule that you cannot judge a film by its box office. Triumph of the Will worked because it appealed to ordinary men and women, many of whom didn't vote for the Nazis in the first place: it was a hit because, to quote Leni Riefenstahl, it "impressed an audience which was not necessarily interested in politics". 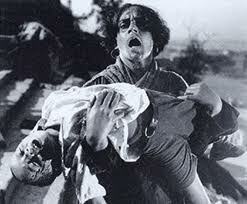 Battleship Potemkin, which had all the distribution you could ask for, failed to become a popular hit. This is not because punters in the 1920s were stupid: it is because the film preaches to the converted. The Party's message had become so saturated in popular art and culture that there was no need for anyone in the Soviet Union to see it. Time has not been kind to Battleship Potemkin. Certainly the decision of the Brussels World's Fair to name it the greatest film ever in 1958 looks every bit as foolish as the Academy's decision to give the Best Film Oscar to How Green Was My Valley over Citizen Kane. Its innovations in editing and structure still stand, and as an historical artefact it retains some degree of importance. But otherwise there is precious little to celebrate about it, falling short on an emotional level of both Griffith and Riefenstahl.